The Poptart Manifesto by Rick Gualtieri: Mark your calendars. Shining Fury is coming. Mark your calendars. Shining Fury is coming. 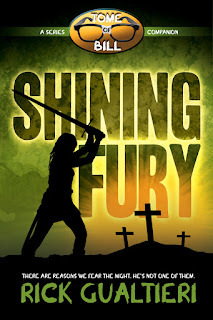 SHINING FURY (a Tome of Bill Series Companion) is coming April 29! I am pleased to share both the cover and the teaser from this, the second companion piece in The Tome of Bill series. Taking place concurrently with The Wicked Dead, Shining Fury follows Sheila O'Connell - the prophesied last defender of humanity. Icons, legendary warriors empowered by pure faith and driven by their unerring belief in their own invincibility. For centuries they have stood against the undead as shining beacons of light against the coming darkness. Sounds good on paper, but don't believe the hype. At first glance, most see just a shy girl from New York, but to the denizens of the night – vampires, witches, and their ilk – I am a nightmare given flesh, born to raze their kind from this very Earth. I am the Icon, the Shining One, the last defender of humanity against the oncoming tide of darkness. Despite all my power, I am afraid. And if I can’t conquer my fear, face my demons, and overcome the feelings I have for a man I must destroy, then I shall be utterly consumed … and the world will know endless suffering for my failure. "And many of them that sleep in the dust of the earth shall awake, some to everlasting life, and some to shame and everlasting contempt." Meg turned to Bernadette. "Revelations?" "Whatever. I'm thinking it's safe to say these guys are in that latter group." "At least now we know why the streets are so empty," I added, counting at least a dozen of the creatures advancing upon us. They looked like zombies. Bill and Ed had mentioned them to me, but according to them, although real life zombies looked like their fictional counterparts, the vampire hierarchy used them for mundane clerical work of all things. I'd been both amused and insulted to learn the undead equivalent of my old job was entrusted to walking corpses. The things advancing on us, however, didn't seem to have much interest in paperwork. Their eyes shone red and feral in the gleam of the flashlights as they doubled their pace toward us. "Brothers," Bernadette called out, "this is the first of the unholy blight we have come here to face. Trust in your training, but most of all, trust in your faith." I decided to add a bit of practicality. "Swords only," I barked then lowered my voice to address Bernadette. "Let's take them quietly if we can." "We'll hold back, too, unless you need us," Meg said. I nodded then turned to face the oncoming threat – not quite a horde, but still potentially dangerous. I felt something in my mind tighten, my focus turning to the enemy at hand and, insanely enough, an anticipation of the conflict to come began to suffuse my being. I drew my own weapon. A part of me was tempted to command the Templar to hold back, that this enemy was easily dealt with on my own. It was a struggle to not heed its call, but I managed to push it down. To appease that part, I instead let my power fly free. Not all of it. Lighting up the dark street like the Fourth of July could be just as counterintuitive to a stealthy approach as a firefight. However, I let enough out to cover myself in its soft white protective glow, the blade practically singing in my hand as I did so. I stepped forward with enough Templar to equal the enemy in front of us. "Take out their heads," Kelly called out from behind. I glanced over my shoulder at her and she added. "I watch a lot of TV. You have no idea how many people screw that up." Affording her a small smile, I turned away and stepped forward. I held back the battle cry on my lips, instead opting to let swift and savage action do my talking for me. Though I wanted – almost needed – to launch myself into the center of the fray, I forced myself to hold my position relative to the Templar, opting to engage the zombie on the rightmost edge of their loose-knit grouping. The pathetic creature only had one complete arm, her ... its other ended in a ragged stump several inches below its shoulder. It hardly seemed a fair fight. Had I tried anything like this a year ago I, more than likely, would have tripped and stabbed myself. Now, though, I moved with a fluid grace … employing precise steps as if I'd been training my entire life. I side-stepped the creature and kicked its legs out from under it. It fell forward, not even trying to break its fall with its one good arm. It landed face-first, eliciting a grunt that sounded less one of pain and more air simply forced out of its rotting body. With no hesitation, I lifted my sword and brought it down in an arc. The human skull is thick and well protected, but my weapon was aglow with the fires of faith magic. I bisected her ... its skull just above the jawline, my weapon sending up sparks as it passed through the creature's head and met asphalt. Its body shuddered once and became still. Somewhere deep inside of me, I felt a pang of regret. Whoever it had once been, there was little doubt it hadn't asked for this fate. Though I didn't share the Templar's beliefs, I said a small silent prayer nevertheless, hoping that this tormented soul was now at rest, before turning to see how the rest were doing. It was a similar situation for the most part. The other Templar had heeded the warning and been both quick and decisive. It looked like this battle was over before it had even begun. I let out a breath and my power dissipated from around me. "If all the legions of the damned are like this, then surely we won't fail." I glanced to find Vincent a few feet away, having likewise dispatched his foe. "Don't get cocky," I warned. "Believe me, this is just the appetizer." A cry from further down the line caught my attention. One of the Templar had stabbed his foe through the midsection, rather than aim for its head. The zombie was now pushing forward, undeterred that it was impaling itself, intent on reaching its target. "Damn it," I muttered, not caring if I offended anyone's bookish sensibilities. I waved off the rest still back with Bernadette. Things could get messy with too many cooks in the kitchen. The situation was well in hand. There was no point adding to the existing chaos. Unfortunately, chaos had other ideas. I took a single step when something entwined around my ankle. Before I could compensate, I stumbled and fell. Great! Some Blessed One I was. Couldn't even walk without my feet getting all tangled in the underbrush. Except there wasn't any underbrush. We'd been standing in the middle of the street. I felt more than saw what was happening. A hand had grabbed my ankle. I know because it grabbed me again, higher up on my leg, exerting pressure as if dragging along the body it was attached to. This was confirmed a moment later when the beheaded bodies of the undead in front of me likewise stumbled back to life, attacking their would-be vanquishers, most of whom had dropped their guard. As the not-quite dispatched zombie crawled atop me, I realized that what should have been an easy fight had just gotten a lot more complicated. 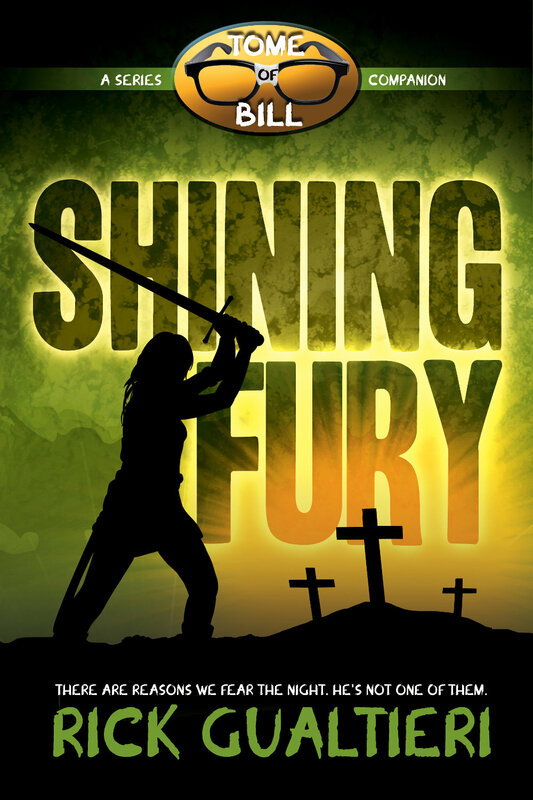 SHINING FURY - Coming April 29th to all major ebook platforms. Yea!! Come on 29 April. When is Book 8 The Last Coven coming out Ive read all the rest of the series and I want to see what makes Ed so special.